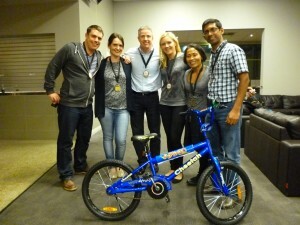 Another fantastic Charity Bike Build program in Perth this week. 3 bikes built and given away to The Make a Wish Foundation, a pivotal piece of the puzzle that allows this amazing organisation to continue granting the wishes of children in need. Although there were 3 teams competing, we had our first ever clean sweep of the points on offer for the day and that was the GREEN TEAM! Not only did they get full points for the programs activities, but they also built a PERFECT bike – Congratulations! This program definately helps you all to contribute to a great cause, but it is also a fantastic team building program to get all participants really working together. 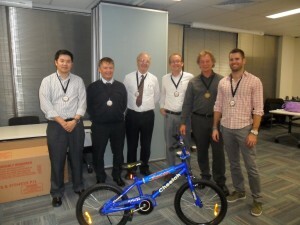 The staff at CSL worked hard today in their Charity Bike Build program in Melbourne. The 7 teams completed activities to earn pieces of a children’s bike. Once all were completed the teams set out building the bikes as best they could. The special moment followed as the bikes were then donated to the Bully Zero Foundation who offered them to 7 lucky children.. It was a great day with fun and energising activities with a charitable outcome.. Well done team.. The students at Box Hill Senior Secondary College worked as one team last week to attempt to open the Vault and steal the Golden Eagle. This “one team” challenge offers great activities that require teamwork to complete. As the team successfully complete the given tasks they earn clues to the code of the Vault safe.. Its ok to get to the Vault but can you decipher the codes and open the Vault? 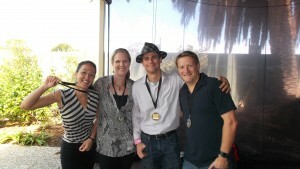 The team from Woodside Energy had a fantastic morning in Perth CBD yesterday during their Scavenger Hunt. After finding the required locations, taking photo’s and collecting their items, their hunt concluding up in Kings Park where the scores were tallied. The PINK TEAM were lucky enough to take out the top prize with a total of 2300 points – Congratulations! Thanks very much to the team from Chevron – KJV Gorgon in Perth who through their Charity Bike Build program yesterday, were able to donate 3 bikes to the Make A Wish Foundation. What an opportunity to change a child’s life in such a positive way. 3 teams participated in a number of activities to help add to their team score before they were faced with the challenge of building their bikes to the best of their ability. The BLUE TEAM was victorious on the day, having the best built bike combined with the best overall score from the other challenges. 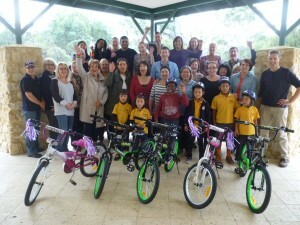 Thanks to the group from Silver Chain in Perth who through the hard work and determination during their Charity Bike Build Program, where able to donate 5 bikes to 5 deserving kids from Koondoola Primary School last Friday. It was a well fought battle, but the BLUE team came out on top as winners for the day. The real winners however were the deserving kids who now have a brand new bike to enjoy for years to come. Check out the video below with some fantastic photo’s from the event.